It was report card day for Belize’s economy on Wednesday, June 29th, when the Statistical Institute of Belize (SIB) released the first quarter report of the Gross Domestic Product (GDP) for 2016. According to the report from the SIB, the rate of unemployment went down compared to the same period in 2015. However, it was not enough, as the country’s economy shrank by 2% in the first quarter of the year. The report also included information on the external trade statistics, as well as the Consumer Price Index, particularly for the month of May. 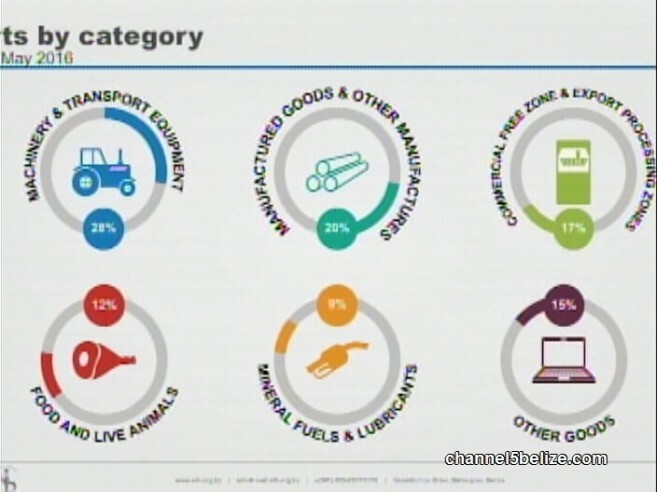 According to the report, the inflation rate for the period this year is 1% higher. Overall, prices in the basic food market are also 1% higher compared to last year. According to SIB Statistician Angelita Campbell, there was a 0.4% increase in the cost of food and non-alcoholic beverages, while in the category of housing, water, electricity, gas and other fuels, cost went up by 1.6%. However, while there was a cost decrease in certain services such as in transportation, she also pointed out that there was a variation in the food and non-alcoholic beverages. “In the food and non-alcoholic beverages category, we saw a variation across the prices of food,” said Campbell. “For instance, we have beef going up by 7.2%, pork by 6.2%, while chicken went down by 2.6%.” She further mentioned that such variations had an effect on the overall numbers in different areas that contribute to the economy. The report also highlighted that Belize had produced goods and services valued at $718.4 million from January – March of 2016. When this figure is compared to the same period last year, there is a decline of $14.7 million. The large decrease was alarming, despite a growth in both the Secondary and Tertiary economic sectors. Agriculture and fisheries reported the major decreases, with marine products, citrus and bananas adding to the downfall in the economy. Additionally, due to issues in the shrimp industries, marine exports went down from 4.5 million pounds to less than 1 million. The result was a $17 million loss. In regards to banana exports, production went down by 42%, and citrus by 17%. While in livestock and sugarcane the production managed to grow 7% and 27% respectively. There was an increase of 4.2% in the Secondary economic sectors, largely due to the performance of the electricity and water industries. High water levels due to early rains caused electricity generation to go up by some 54% and water distribution went up by 7%. In the construction and beverage production industries, there was also an increase by 12% and 13% respectively. In the tertiary sector, which is responsible for more than half of Belize’s total economy, a growth of 4% was recorded despite a 15,000 cruise ship passenger decline in the given time period compared to last year. In addition, overnight visitors grew by some 17,000, resulting in a 5% upshot in the accommodation and food services industry. While in the wholesale and retail trade, there was an increase of 2%. As it pertains to the labour force, a national survey covering fewer than three thousand households was conducted by the SIB in April during a four-week period. The results indicate that of the working age population, 146,918, persons are gainfully employed. This new result indicates almost 6,000 persons more who are working this year than the same period in 2015. “Looking more closely at labour force participation, nationally, for this round of the labour force survey, it was about 63.7%, not much compared to April of last year,” said Campbell. Overall, there are more males presently employed than there are females by a difference of 27%. It is expected that if the economy continues on this path, the shrinking in its performance might increase, affecting tremendously the sectors that are already experiencing a major decrease in the first part of the year. However, it was also noted that the economy might experience a low but positive growth at the end of the fiscal year.